I like knitting so cks and shawls and hats. I like lace and beads and picot edges. But, most of all I like cables. 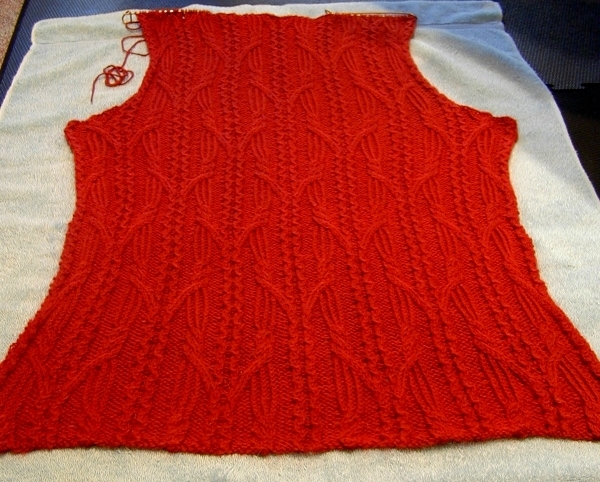 Here is the back of my latest cable project. It is the Pewter Coat from Interweave Knits Winter 2006 issue. Although the pattern called for a cashmere blend that cost $30/skein, I found a cheaper yarn. I'm using Knit Picks Andian Silk in cranberry. This isn't the only project I've been working on in my absence. For Christmas I made a pair of socks for my sister. The pattern is a variation of the Rockin' Toe Up Sock pattern by Gail. 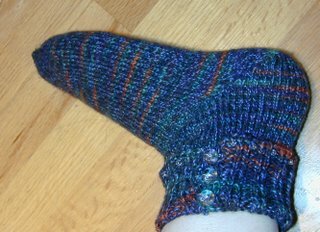 Stockinette stitch from toe to heel. 2x2 rib up the cuff. Knit in round halfway up the cuff and then split and knit back and forth. The cuff folds over at the point it splits in two. Clear beads around the top of the cuff. Clear bobble buttons to keep the cuff closed. I made loops using a small crochet hook for the buttonholes.